As I've been spending the bulk majority of Summer Brain 2017 ™ lamenting my inability to keep track of all things bloggish, it seems counterproductive that I'd not only decide to finally brand this site with its own dedicated domain, but also start a whole new website. Laughable right? Even more absurd would be if for some reason I decided to make a site that required committing to a schedule and making sure I had a sizeable readership who would be interested in what I'm promising. By now you've been reading my grumblings long enough to know where this is heading. On the nonstop express train to cute mascot town! 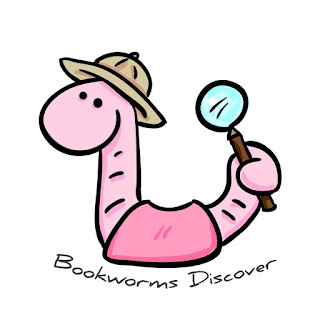 Introducing Bookworms Discover, a website dedicated to bringing highly underrated books into the spotlight with once a month free book promotions. This site will be something of a hybrid that falls between the daily promotional newsletter sites and large but infrequent events. The biggest difference however, will be that my focus won't be on the big names, bestsellers, or highest rated books. Instead, on the first Thursday of each month, Bookworms Discover will feature no more than 30 free books by authors you might not have heard of. The idea is to help good stories find an audience. It's not easy to market a book. When I first began almost five years ago, I was 100% clueless. But I was also lucky. Five years ago, there was only a fraction of the number of books being published and I was able to stumble my way blindly into a small measure of success. Today, it's way more difficult to do this. Especially if you don't have money to spend on ads from day one. And even if you do have money, a lot of sites require a certain number of reviews, which leads to a lot of folks chasing reviews. But review chasing is a different rant for a different day. What I'm hoping for is to get books legitimately into the hands of readers. Readers who might enjoy what they read and might be inclined to tell others. In doing so, perhaps these underrated books will pick up a few organic reviews, meaning they could eventually qualify for the bigger promo sites where they might finally find the audience they deserve. Which is where you fine folks come in. I'd like to hope that if you're reading this blog, you're a fan of reading in general. If not, you might know someone who does enjoy reading. I would love for you to check out Bookworms Discover, read over the pinned post, check out the for readers and for authors pages, perhaps subscribe and follow on social media, but also, I would greatly appreciate it if you would help spread the the word. Recommend this site to others, and ask that they do the same. Why? Because I'm just one ant, trying to move a rubber tree plant. For this crazy plan of mine to work, I need help. So this is my call for help. Really though, is it a sacrifice? I ask you to share this project and in return, you get up to 30 free books every month. Seems like a win for everyone. Thanks for listening, thanks for putting up with my crazy train ideas, and most importantly thank for your support! I've Been Doing This For How Long?